Is the suspense killing you? The wait is over. 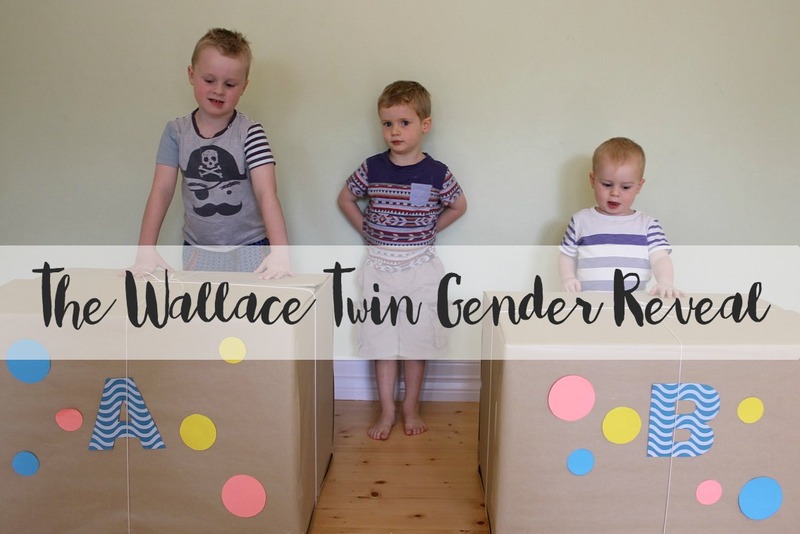 It’s time for the Wallace Twin Gender Reveal! Will the twins be one boy and one girl, two girls or two boys? Not two of each as I accidentally say in all the excitement! 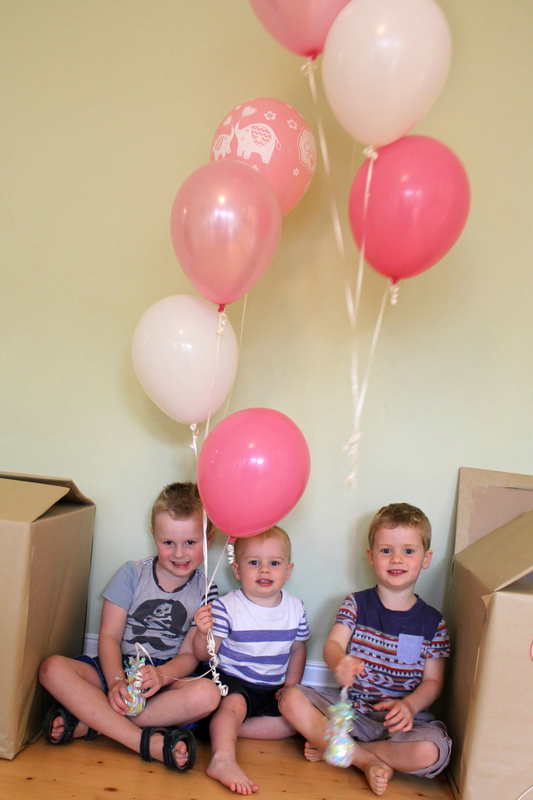 Here’s how we revealed the gender of the twins to our three lads. Before this, they had no idea. Watch the video and all will be revealed! What do you think? I was blown away when we found out. The gender of each of the boys was a surprise at their brith. This time around we figured we’d had enough surprises already. The scan was amazing. The twins are growing and are both healthy and strong. It’s fascinating seeing two babies! During the scan the sonographer might be checking twin B and suddenly twin A’s foot or hand would pop in to view. It’s such an amazing thing to watch. At one stage during both babies feet were next to each others and we could clearly count all TWENTY toes. But, back to the twin gender reveal. After doing all the important stuff, the sonographer told us that twin A was a girl. Mr Wallace and I exchanged smiles, what lovely news! Then it was time to find out whether twin B was a boy or girl. I’ve no idea why, but the excitement and the emotion really kicked in when the sonographer said ‘congratulations, another girl’. I cried, actually, I sobbed. There were tears of joy and tears of relief and tears of utter shock, again! Having never cried before at a scan, I’ve been a total wreck with this pregnancy. The pregnancy has been a huge roller coaster of emotions. First there was the total surprise of finding out we were pregnant with twins. Then, once the double hormones struck, came the struggle of the first trimester. Finding out the twins are two girls was amazing, and another massive surprise. I was convinced my body only made boy babies! Of course, we would have welcomed and loved the twins regardless of their gender. Yet I can’t deny that twin girls is exciting. There will almost be a gender balance in our house. Mr Wallace will get to experience being a father to daughters. I’ll be able to sew all the pretty things for little girls. The boys will have sisters! The twins will grow up with three big brothers. Honestly, I couldn’t have asked for anything more. I feel incredibly lucky, and dare I say, blessed, to be having two daughters. Now I need to get my head around parenting (a) twins (b) girls and (c) five kids! Two girls, can you believe it? ← The HARS Museum in Wollongong: amazing for plane enthusiasts! Thanks Cat, it sure is exciting! PS don’t panic if you can’t tell them apart I still can’t and mine are 11!!!! Great to know! It’s looking like they will be fraternal, but I must remember this. I’ve not been asked the IVF thing yet, I think people assume no one would be crazy enough to do that! But no doubt I’ll get it soon enough! Thanks Emma, we’re very lucky! LOVE the video and the boys’ excitement!!! Thanks my dear, they sure were excited! Oh wow, I loved that video! And two GIRLS! What will you do with girls?! Haha. Wonderful Claire, I was so sure you would be having two more beautiful boys 🙂 Your boys are so CUTE too! So excited for you! Oh thanks Cate, that’s lovely. After so much blue, I’ll welcome pink, for a while at least. Thank you, I was overwhelmed at the thought of having such a large family. But I do think it will wonderful and busy! How exciting! I got a little teary for you! Oh gosh, I didn’t mean to make people teary! Tears of joy though, right? I definitely have something in my eye! I think I was as excited watching your boys open the boxes as they were opening them! 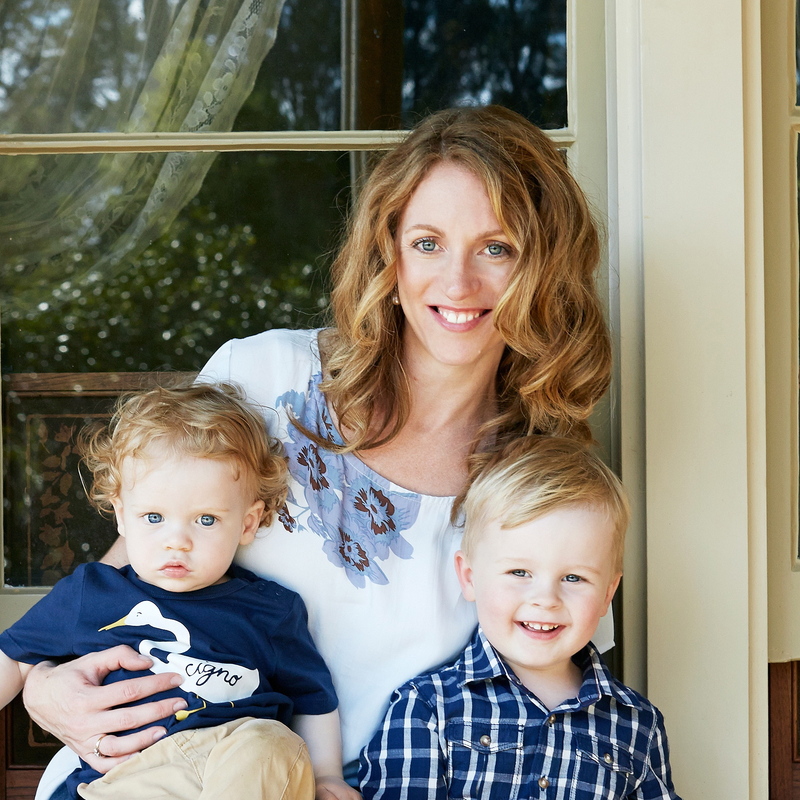 I’m so happy for you – two babies is exciting whatever the gender – but I love that your two girls will address the gender balance in the Wallace household! Woot! I must admit that we are all very excited! What lovely news Claire! Some girls to balance the household, yay! Can’t wait to see all your lovely sewing too. Thanks Sarah, it will be lovely to get a little girl power in the house. Now I just have to find time to sew!! Thanks Erin, and they sure are lucky to have three doting big brothers. Can’t wait to hear what you have! Beautiful! How exciting for you all! Thank you Jenna, it is exciting for our family. Such a beautiful video! The boys are super excited and such a great way to include them. Thanks Simone, we wanted to get them involved and they sure were enthusiastic! How lovely for your family! Thanks Amy, it’ll be great to balance things out a little and for the boys to have more female influences in their lives. Oh Carol, thank you! I hadn’t actually even thought about the hair braiding, but you’re right!! Thanks ever so much, it sure was a lovely surprise! Oh yay I’m so excited for you Claire! I totally cried watching the video. I can’t wait for our own scan in 3 weeks, I’m dying to know what we’re having. We didn’t do a big gender reveal with bub, but I’m thinking of doing one this time because I know it’ll be exciting for her. I know Caroline, I’m embarrassed to admit how excited I am about the sewing. Hoot! Fantastic news, congratulations!!!! Not having boys I can’t comment on the differences, but I do know that I love having girls and you will too! Thanks Kylie, I am really looking forward to experiencing parenting both genders! I really only thought I’d be a mum of boys. I know Nim, isn’t he funny? I do think these girls are lucky to have three doting big brothers! Thanks Janet, it is lovely news. Thanks Sarah, we are all rather excited! Thanks Lauren, it was a fun way to share the news with the boys. Congratulations how delightful. I absolutely loved how excited your eldest son was to see the pink balloons after thinking they were boys. A gorgeous moment. Thanks Michelle, his teacher had told him we’d almost have a football team if we had two boys! I was relieved when he was happy about the girls! Thanks ever so much Jacinta, we feel very blessed. Thanks Tegan, it is exciting news! Oh thanks Kim-Marie, we’re excited too! Such awesome news! Congratulations! And I loved the boy’s reaction! It was so cute and sweet! Thanks Paula, they certainly got into the spirit of it all! Oh I totally missed this! This was gorgeous to watch. How exciting! They look so chuffed to have sisters coming. Thanks Eva, we’re all rather excited. Not long to go now!